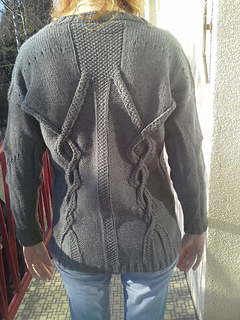 The cardigan is knitted from top down, seamless. You will start by casting on the stitches of the back and thus knit flat including step by step the Cable panel. Then you will pick up the stitches for each front that you will knit flat to the same length as back. 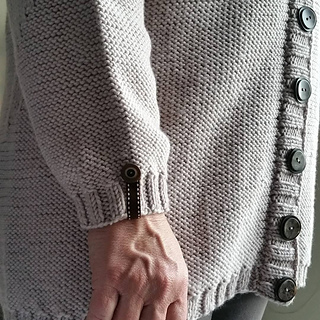 Once you’ve reached the armhole length for both front, you will join the back and fronts and knit flat to the ribbed. When you’ve finished the body, you will pick up the stitches along the fronts and neckline to knit a ribbed band. The sleeves are knitted last, in round and end with ribs. Bust circumference: 44½ (50½, 58½, 66½) inches; 111 (126, 146, 166) cm, 10-11¾ inches; 25-30 cm of positive ease include. a - Upper back width: 19¼ (22½, 26¾, 30) inches; 48 (56, 67, 75) cm. b - Back width: 22¼ (25¼, 29¼, 33¼) inches; 55.5 (63, 73, 83) cm. c - Armhole depth: 7¼, (8, 8¾, 9½) inches; 18 (20, 22, 24) cm. d - Upper arm circumference: 14½ (16, 17½, 19¼) inches; 36 (40, 44, 48) cm. e - Sleeve length from underarm to cuff: 13¼ inches; 34 cm. f - Length from underarm to hem: 18 inches; 45 cm. • Needles: US 8; 5.00 mm circular needles and dpns. US 9; 5.5 mm circular needles and dpns. needles US 9; 5.5 mm, after light block.